Most comedians are good at telling jokes. 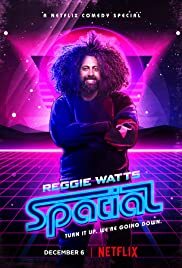 Reggie Watts is good at everything. Completely improvised show weaving together sketches, short stories, and dream sequences, filmed live on a soundstage in Los Angeles, Watts waxes poetic about flight, grits, and guns. Reggie Watts is a musician, singer, beatboxer, actor, and comedian. His improvised musical sets are created using only his voice, a keyboard, and a looping machine. TRAILER: Verónica | Streaming NOW on Netflix!